Congratulations to Robert, winner of yesterday's Person-of-Mystery contest! Robert correctly identified Ben Lilly. 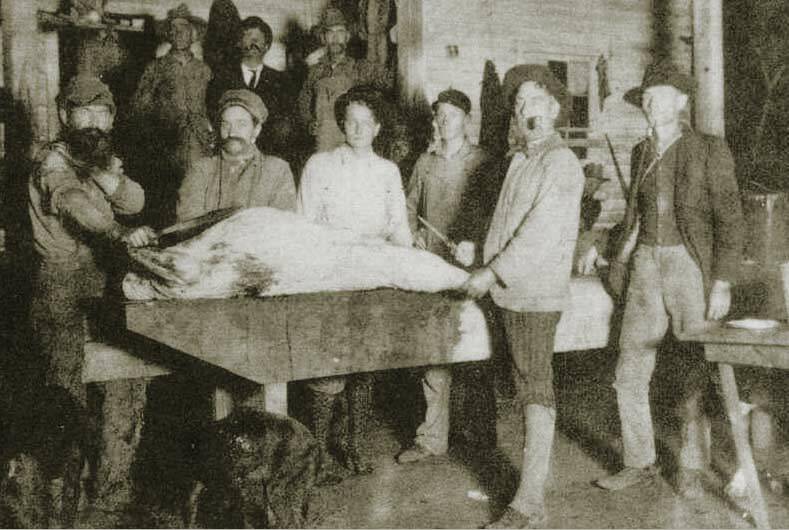 Ben Lilly is something of a curious hunting legend in early East Texas / New Mexico. 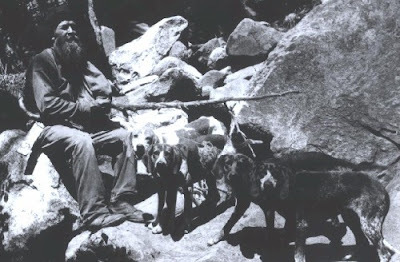 He was known for being one of the best of the big game hunters of all time and the last of the true mountain men. Like other legendary hunters, mountain men, and pioneers, he seemed to have a life-long wanderlust and perpetual quest for better hunting grounds. Born sometime in 1856 in Alabama, while young his family moved to Mississippi. In an attempt to tame the lad, at age 12, he was sent to Military School, but ran away to Louisiana, where he worked as a blacksmith (it's said that he was really keen on making knives) and later on his uncle's cotton farm. He was known for his unnatural strength and stamina. It's said that he would lift 500 pound cotton bales by himself, and amuse himself in the blacksmith shop by taking the anvil by the horn with one hand and lift it straight out in front of him. He was fast on his feet and once bet a local athlete he could round a baseball diamond quicker on all fours than the man could run it with two. Lilly crossed home half a base ahead. Lilly was also a bit of a prankster and known for his eccentricities. He would sometimes put an ear of corn in his pocket and grab a blanket and then go disappear into the woods for a week or more. One day, his wife complained about a hawk who was getting their chickens. The hawk flew away as Ben grabbed his rifle and ran after it. Over a year later, when Ben returned, his excuse was, "That hawk just kept flying." Although a rugged individual, Lilly was raised as a devout Christian and over his life he refused to smoke, drink, or hunt on Sundays. He was known for being a soft-spoken individual, always used proper English, and had a soft-spot for children and babies. While in Louisiana he killed his first black bear with a knife and this sparked what he considered a divine appointment to personally eliminate all man-killing animals (bears and mountain lions were his favorite targets). 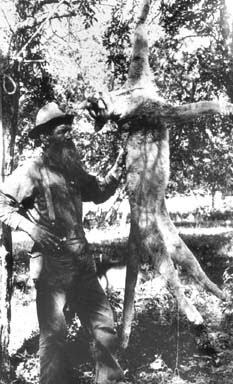 For the rest of his life, Ben Lilly, made it his regular habit to hunt every day (excepting Sunday of course). In 1904, upset that most large predators had been eliminated he signed all his property over to his wife and crossed over into the Big Thicket region of Texas. He is credited for practically singlehandedly eliminating wild bears from Mississippi and Louisiana and it's said that there were only about a dozen left in East Texas when he moved on. The same year, he was hired by the US Biological Survey to send specimens back to Washington, many of which are still in the Smithsonian. As a single bear could easily consume $500 in cattle in a year, bounties on bears and cougars were easy to come by. Ben Lilly soon moved from selling bear meat and honey to collecting large bounties from ranchers and the government. "I never met any other man so indifferent to fatigue and hardship. The morning he joined us in camp, he had come on foot through the thick woods, followed by his two dogs, and had neither eaten nor drunk for twenty-four hours; for he did not like to drink the swamp water. It had rained hard throughout the night and he had no shelter, no rubber coat, nothing but the clothes he was wearing and the ground was too wet for him to lie on' so he perched in a crooked tree in the beating rain, much as if he had been a wild turkey." In 1908, Lilly crossed over into Mexico and took to the Sierra Madre mountains to pursue game there. In western Coahuila there had been a large bear with a star shaped patch of fur on its chest that had terrorized the local population. Local lore is that a bearded gringo passed through the area and the bear was never seen again. 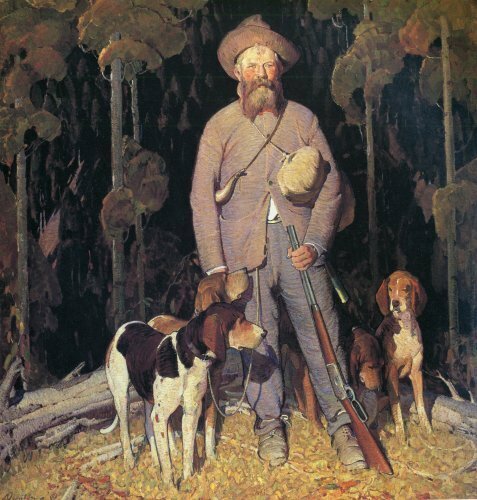 By 1911, Lilly had returned to the US and settled in the Gila Wilderness of New Mexico, where he continued to hunt. 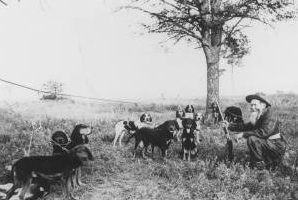 Exact numbers of his prey are hard to calculate, but in 1925, Lilly buried one of his hunting dogs and noted on the box that the dog had helped kill 210 bear and 426 lion in the animal's 11 year life (this being only a fraction of Lilly's hunting days). One source places Lilly's lion total somewhere between 600 and 1,000. Lilly took a couple hunting rifles, but was known on many occasions to dispatch large bears or cougars with one of his custom knives, of which he typically carried two, one for killing and the other for skinning. In 1921, at age 65, Lilly served as a guide for oil baron W. H. McFadden's hunt through the Rocky Mountains and up into Canada. Lilly stayed strong and able well into old age. He claimed his vitality a result of living in nature and also to the belief that 'you are what you eat.' Lilly held that his diet of lion and bear meat endued him with those animals' abilities. Lilly was also known to be a keen observer of animal habits. He would often keep the lion cubs from a kill and raise them affectionately, studying their behaviors before killing the adult animal. Ben Lilly lived out his final days on a ranch outside of Silver City, New Mexico, where he died on December 17, 1936. If you'd like to read more about Ben Lilly, there are a number of good books about his life, my favorite being "The Ben Lilly Legend," by J. Frank Dobbie.